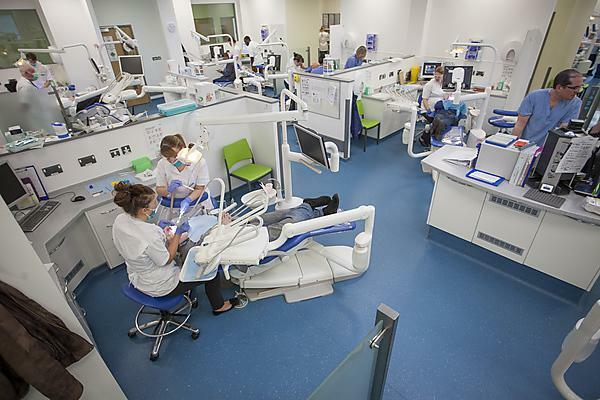 Almost all (99.97 per cent) of NHS patients treated by dental students at Plymouth University’s Dental Education Facilities in Exeter, Plymouth and Truro, would recommend them to their family and friends, according to the national Family and Friends Test. All providers of health care are required to carry out the Family and Friends Test as part of the NHS’ commitment to improving the patient experience. The scores were high for all four DEFs: Exeter scored 100 per cent; Devonport and Derriford 95 per cent; and Truro 94 per cent. DEFs are where dental students treat NHS patients as part of their studies, under the supervision of qualified dental care professionals. The first DEF opened in Exeter in 2008 and since then around 18,000 people in Devon and Cornwall have received NHS dental care where they may not have done so before. The Friends and Family Test results come at a time when a new DEF is being developed for NHS patients in and around Exeter. The current DEF is situated at Heavitree Hospital and opened in 2008. Since then first-year dental students have provided basic NHS dental treatments and assessments under the supervision of qualified dental care professionals and the DEF was limited to 17 dental chairs. The new DEF is being developed in a refurbished building formerly home to health care researchers, at the Veysey Building on Salmon Pool Lane. The number of chairs will increase to 42 and local NHS patients will benefit from a wider range of treatments provided by third-year dental students and students from the University’s BSc in Dental Therapy and Hygiene course. The new building will also be home to a comprehensive dental community engagement programme run by the Peninsula Dental Social Enterprise Community Engagement Team, with a number of projects and initiatives designed to raise oral health awareness and improve access to dental care for targeted sectors of the community. The new Exeter DEF will accept its first patients in autumn of this year.